There are many new varieties of vegetables that are compact, low growing, and ripen their fruit sooner than the regular kind - perfect candidates for growing in pots and containers. To grow vegetables in smaller confined spaces, you still need full sun, but you'll need to water more often than if the same plants were planted in the ground. 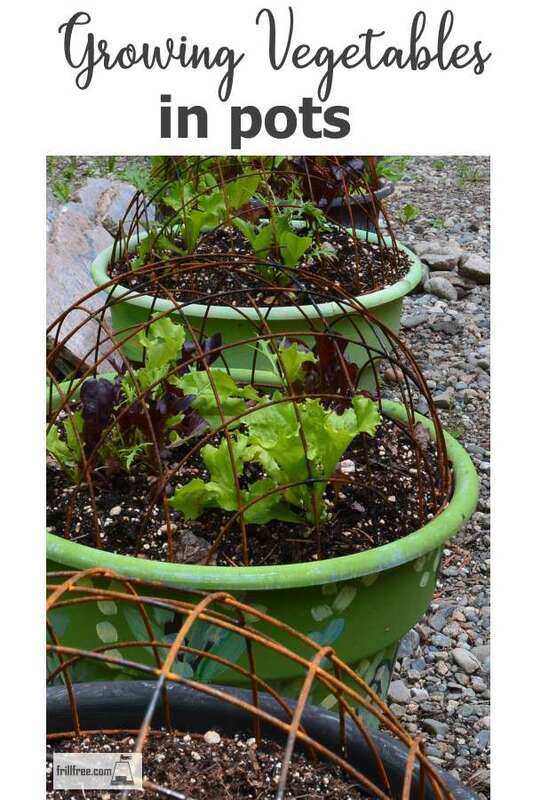 The pots dry out faster, so you'll need to be aware of the type of soil, as well. The best options for container growing are the types of plants labeled 'patio' or 'basket' sized. These tend to be bred for their habit of remaining shorter and more compact than their parents, whilst still having the same taste. Tomatoes - look for varieties like 'Tom Thumb' and 'Tumbling Tom' which are bred for planting in hanging baskets to save even more room. Radishes - the shorter red types rather than daikon will work better in the shallower soil in pots. Patty Pan Squash - 'Sunburst' is listed as space saving bush-type plants - just because they're dwarf, doesn't mean the fruit is any less tasty! Red or Green Peppers - look for one variety called 'Redskin'. Capsicum peppers have a lot of tiny, really hot fruit. Lettuce - micro greens are cut when they're only a few inches tall and still deliciously tender. Re-seed frequently for subsequent crops. Other kinds of greens like Asian stir fry greens, spinach. Use the 'cut and come again' method to keep them producing for a long time. Baby lettuce and other greens are called 'cut and come again' greens. Cutting them off gives them a chance to grow again, giving you a second (or even a third) crop. Even a few vegetables planted in pots near the kitchen door can give you an astonishing array of fresh pickings to add to a salad. Plant a good variety of things so you can swap them out with new ones as the summer goes on, making sure you always have something fresh and interesting. The soil for container growing is a lot different than what you need in a garden. Don't use garden soil in pots and expect to have great success. The type of conditions in a container are a lot different than a garden bed, and, with garden soil you could miss the crucial mix of micro organisms, like certain fungi, millipedes or bacteria. Without this beneficial micro herd being in perfect balance, your growing area will be deficient in something or other. I recommend pasteurized soil, and this is the perfect way to recycle last years soil mix, and add some more nutrients to it. I use a big kettle over a bonfire to pasteurize the soil, after mixing the old potting soil about half and half with matured compost (pick the worms out first, and return them to the bin) and cook it until the interior of the kettle of soil is steaming. Then take it off the fire and let it cool. Mix in a coffee can of Dolomite lime to buffer the pH, and then it's ready for planting.